This is the first video from my series “9 Advanced Guitar Strumming Patterns You’ll Love”. I chose these strums because they have been some of my most useful strums I’ve taught over the years. They work for a wide variety of music and provide a good foundation to create variations and new strums. They also sound good. I’m teaching these strums on an acoustic guitar using a pick. All of these strums can easily be adapted to work with fingers also. It’s absolutely free. I’ll ask for your name and email and then send you a link to the lesson site. great lesson thanks I’ll be able to use these chords soon. Tomas Michaud would love to hear your progress. I cannot get the first and the third videos to play, but the second one works just fine. I tried to click on play for videos 1 and 3 and it also works just fine for me. The usual reason why videos wont play is the slow internet connection. You might just be experiencing such during the time you tried to play the videos. as I am going to try to figure out what might be the cause. I listen to your first strum. I am from Trinidad in the West Indies. 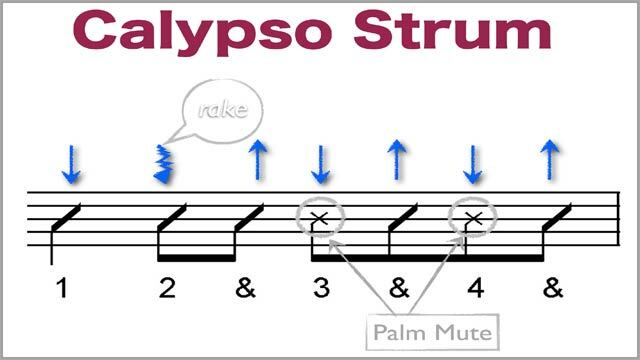 That strum is not a Calypso Strum. Trinidad is the birth place of Calypso you will find a variety of strums for calypso on youtube. Ì you can provide example song for each song then it will be awesome. By the way, it dose not have to be a song, it can be a list of song that we can use to practise for each drumming pattern.